Plans were drawn up in 2016 to expand the Moray East Offshore Windfarm westwards. Plans for a massive offshore windfarm in the Moray Firth have been approved by Highland councillors after a debate over its visual appearance. The 85-turbine Moray Offshore Windfarm West – which is due to begin construction in 2021 – will lie around 14 miles off the Caithness Coast, adjacent to both Beatrice and Moray Offshore Windfarm East. The farm, once complete, is expected to generate power for more than 900,000 homes across the north. During the Highland Council’s north planning committee meeting yesterday, councillors debated the proposals for an hour and a half considering the overall layout of the farm and its potential impacts on communities on the coast. Objectors have previously raised concerns over the construction of the site and the effect its underground cables could have on the private water supplies in the area. Councillor Mathew Reiss spoke of the overall economic impact it would bring to communities across the Highlands alongside the other windfarms. 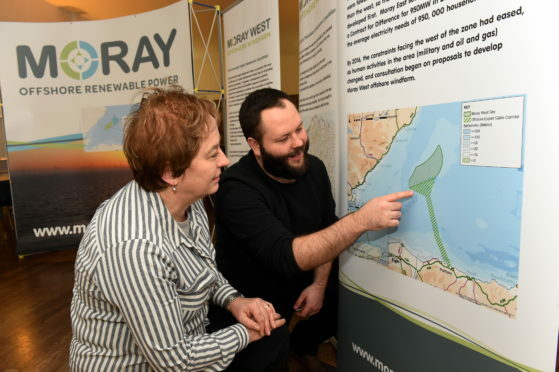 He said: “The power that will come from all the offshore wind farms in the Moray Firth is enough for approximately 1.5 million homes and that’s going on the renewable energy operators own figures. Committee chairwoman Maxine Smith put forward a motion in support of the project stating the “economic benefits offered by this development far outweigh the adverse impacts” such as visual impact. The Scottish Government are expected to make a decision on the projects future by Spring 2019. Carlos Cerezo, project director for Moray West, welcomed the council approval. He said: “We are pleased that Highland Council has chosen to support the windfarm in response to this consultation, and we would like to thank members for their consideration of the application.